Governance, Risk and Compliance Management solutions offer a platform to control risks that might adversely affect realization of an organization’s business objectives. GRCM covers a broad range of risks typically entailing financial,information technology, and legal issues. Their goal is to prioritize the risks, justify funding for remediation, and use policy to guide operational teams in corrective actions. configuration data for thousands of IT assets in scope is impractical, and prevents maintaining an accurate asset repository and conformance with policy. An organization cannot effectively set and manage policy without knowing this vital information, so a tenuous posture for compliance is the unavoidable result. 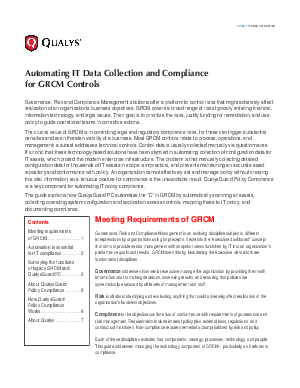 QualysGuard Policy Compliance is a key component for automating IT policy compliance.